New Avon exclusive figurine for 2008. 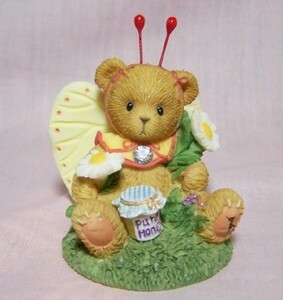 This little cherished teddie is dressed as a springtime butterfly with pure honey to eat and accented with simulated gems! Butterfly wings and daisies will remind you of spring every day! "You're The Sweetest Thing To Ever Flutter By" is what is on the box. It's 3-1/4" high and made of resin. "You're The Sweetest Thing To Ever Flutter By" figurine.